Why Real Madrid is better without Cristiano Ronaldo ? Cristiano Ronaldo has scored 30 goals in all competition for Real Madrid so far this season, but the numbers shows that he has hardly contributed anything substantial to the team. First half of Real Madrid’s 2015-16 was largely concentrated on the mishaps of head-coach Rafa Benitez. Now that he is gone and replaced by club legend Zinedine Zidane, all attentions slowly shifts to the star player Cristiano Ronaldo. It is highly evident that the Portuguese ace look out of sorts since the beginning of the season. And those who look at the stats may get the false impression that he is doing pretty well this season. The 30 goals from 29 matches this season is just above a goal per match, but evidently all of these goals came against oppositions who barely pose a threat to Real’s attacking force. 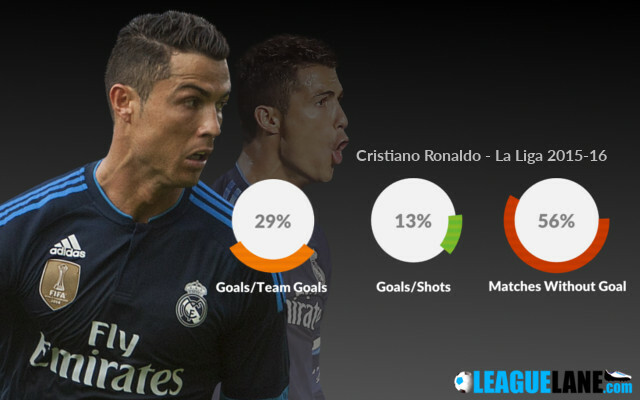 Not only that, in La Liga out of 23 matches in total, Ronaldo has only found the back of the net in 10 matches, means he went missing in 56% percentage of the matches. He took an incredible 143 shots at goal and scored 19 reflecting a tad low 13% conversion rate. Moreover, he is yet to score a goal from free-kick in the Spanish League this season. Ronaldo has failed to score against all of the medium or big opponents this season namely Paris Saint-Germain, Barcelona, Atletico Madrid, Athletic Bilbao, Sevilla, Villarreal and Valencia. It is pretty true that Isco and James are the future stars for Real Madrid. With Ronaldo performing at an incredibly poor level and none of the managers dare to drop him or even substitute him, his presence is a stumbling block to Real’s progress over the next few seasons. With Ronaldo starting every game, either one of Isco or James has to sit out, which may rather result in players becoming unhappy and pushing for an exit at the end of the season. Many media outlets has already reported that the former Manchester United striker has passed his best and it is the right time to sell him. And they are right in every sense, but it not only benefits Real Madrid from a financial point of view, but also helps in re-building the squad for the future. Comment:I think C R7 will be no more if he leaves madrid so the management has to let him stay for some more years. Which is going to cause madrid lot of trophies and damage other talented players as well. Yes. Ronaldo scored a goal from free kick this season. And that against a poor Malmo in Champions League, but not in La Liga like the writer say. And that too his first goal in 100 free kicks. Sell this lame player and put Jese in his place. Real Madrid are literally playing with 10 men all season. Even Borja Mayoral shoots better than him. Not one instance this season, he helped turning the score for Real this season. The tap in hero. Balon d’Or or not ..Messi is still the best..
Cr7 Flies out to Morocco 4 times a week to see his Boyfriend. True that. That’s why Messi is the best, you never hear something like this about him. r onaldo has scored from a free kick position diz season watch his matches well.